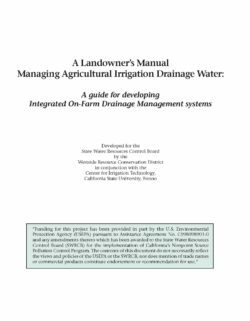 This manual is part of a two-part educational and outreach program to educate landowners and technical advisors about the advantages, disadvantages, costs, environmental regulations and other considerations in developing and implementing an Integrated On-Farm Drainage Management program for salinity control. The first part of the educational program focused on the production and distribution of a guidance manual designed for landowners. It was released in 2004. This manual is the second component of the program, and is designed to provide technical consultants and support personnel with the tools they need to assist farmers with developing and implementing an effective IFDM program. An IFDM system can serve as a viable alternative for landowners who may not choose to participate in a voluntary land retirement program for drainage-impacted lands. Once irrigation systems have been optimized to maximize water use efficiency and to minimize the production of subsurface drainage water, an IFDM system can be designed to enable the landowner to process the resulting drainage water on-farm. Interest in IFDM is increasing. The merits of IFDM have been recognized by the U.S. Environmental Protection Agency and the State Water Resources Control Board through the award of a Clean Water Act Section 319(h) Grant to educate farmers and to train professionals about IFDM implementation. Both manuals were funded by the grant, targeting the needs of the landowners, water/drainage district managers, engineers and technical professionals. Recent threats to water availability as a result of moderate to exceptional drought in several states have raised questions about agricultural water use and efficiencies across the United States. 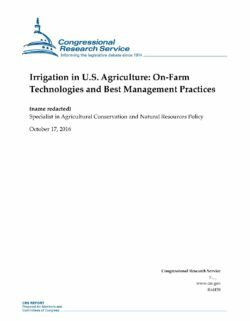 An understanding of common irrigation technologies and the impacts of best management practices in irrigation may be useful to Congress concerning potential policy responses to this issue. As a major user of water, the agricultural industry’s use of water resources continues to be a focal point of agriculture policy. Additional demands on water supplies, extreme weather events (e.g., prolonged drought), and agricultural market conditions have raised producers’ interest in investing in irrigation systems. Increased pressure on the industry to reduce its water use has also drawn interest in the adoption of irrigation technologies and best management practices (BMPs) as a means of achieving efficiency and potential water savings. The federal government performs several roles in assisting agricultural producers with irrigation practices, including financial assistance, technical assistance, research, and monitoring and reporting. The majority of financial and technical assistance is offered through voluntary conservation programs that target increased irrigation efficiency. In some cases, improvements in irrigation efficiency can increase water consumption because farmers increase the number of irrigated acres or grow more profitable, water-intensive crops. This raises questions about how and where federal funds are allocated, particularly in areas where water shortages are a concern. The use and significance of irrigated agriculture varies widely across the United States. Although policy discussions related to irrigation typically focus on western states—home to roughly 71% of irrigated farms—irrigation is practiced in all 50 states and is growing in the east. Over time, there has been a shift in water resources used for irrigation, with an increasing reliance on groundwater and less on the use of surface water. The type of irrigation system used has also shifted over time—from a gravity, or flood-type of irrigation, to potentially more efficient pressurized sprinkler and drip irrigation systems. Pressure systems account for between 58 to 65% of irrigation systems used in the United States and include applicators such as center pivot, surface drip, slide roll or wheel move, and micro sprinkler. 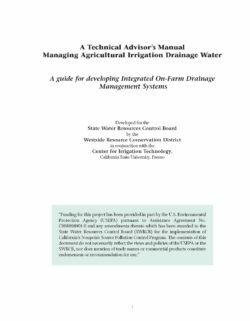 Gravity flow, which includes furrow, and controlled and uncontrolled flooding, accounts for approximately 35 to 42% of irrigation systems in the United States. Irrigation BMPs center around how water is managed on a farm and includes on-farm conveyance, irrigation scheduling, and application methods. Increasingly, precision technologies (e.g., drones, sensor networks, data analytics, etc.) are becoming a common part of many irrigation systems because of their potential to increase efficiencies and reduce costs. The use of irrigation technology and BMPs bring both benefits and costs. The control of water application achieved through irrigation systems can create higher yields and allow the production of higher value crops, while potentially reducing some production costs. The additional cost of installing and maintaining these systems, however, can present a barrier to implementing BMPs. Accounting for variations in the local climate, soil type, water quality, and water availability may also challenge adoption of irrigation technologies and BMPs. Chronic problems of salt, selenium, boron and other naturally occurring elements in surface and groundwater supplies plague agricultural regions throughout the Westside of the San Joaquin Valley and the western U.S. Compounding the problem is the build-up of salty subsurface groundwater resulting from dense clay layers and inadequate natural drainage. The Integrated On-Farm Drainage Management (IFDM) system was developed to manage these problems. A state-of-the-art, yet practical irrigation management system, the IFDM provides for drainage water reuse to improve water availability for crop production and to minimize salt and selenium risks to water quality and the environment. IFDM manages irrigation water on salt sensitive, high value crops and reuses drainage water to irrigate salt-tolerant crops, trees and halophyte plants. Salt and selenium are removed from the farming system and can be marketed. This system views the subsurface drainage water containing salts and selenium as resources, rather than considering them as wastes and environmental problems. The Sacramento Area Council of Governments (SACOG) is an association of local governments in the six-county Sacramento Region of El Dorado, Placer, Sacramento, Sutter, Yolo, and Yuba counties (excluding the Tahoe Basin in Placer and El Dorado counties) and the 22 cities therein. SACOG provides planning and funding for the region and serves as a forum for the study and resolution of regional issues. SACOG prepares the region’s long range plan which considers both transportation and land use. Through the lens of rural planning, SACOG has actively engaged in a Rural-Urban Connections Strategy (RUCS) Program that has studied ways to enhance rural economies and natural assets. The RUCS Program includes a scenario analysis modeling tool that links a parcel-level crop map with environmental and economic factors, including a comprehensive profile of per acre operational cost and return metrics for each crop. The study described in this report looks at how new agricultural crops and markets coupled with improved irrigation techniques will support new specialty crop acreage in the SACOG area. While new and improved irrigation techniques can result in better crop yields and decreased water demands, increases in irrigation efficiency also result in reduced groundwater recharge from irrigation return flows. 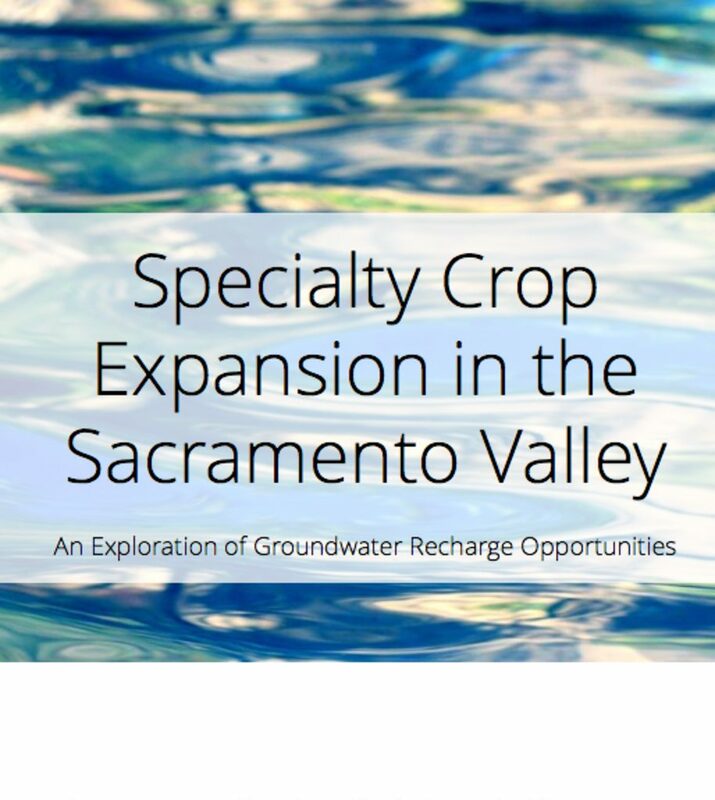 SACOG received grant funding from the California Department of Food and Agriculture (CDFA) to evaluate the feasibility of recharging groundwater on agricultural lands within the SACOG portion of the Sacramento Valley to benefit specialty crop production. The primary goal of the project is to bring together a broad range of different factors impacting groundwater recharge and infiltration and to identify areas across the region that are most suited for strategic flooding of specialty crop fields; in other words, areas that will most efficiently and effectively facilitate recharge, while minimizing cost to the specialty crop producer. 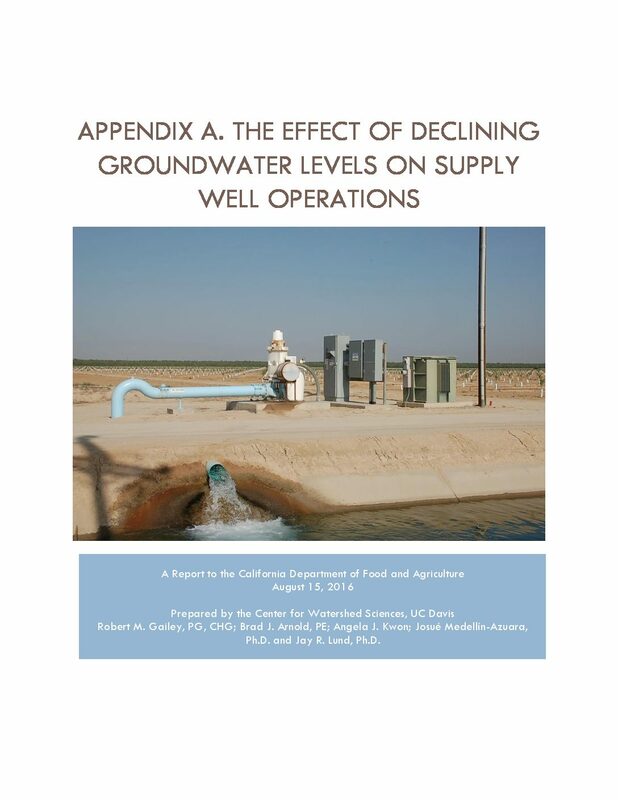 Ultimately, this feasibility information will be incorporated into SACOG’s RUCS model to evaluate the potential benefits of recharging groundwater on agricultural land for the benefit of specialty crops.